Left: Dante Carlos. Right: Poster design by David Chathas. 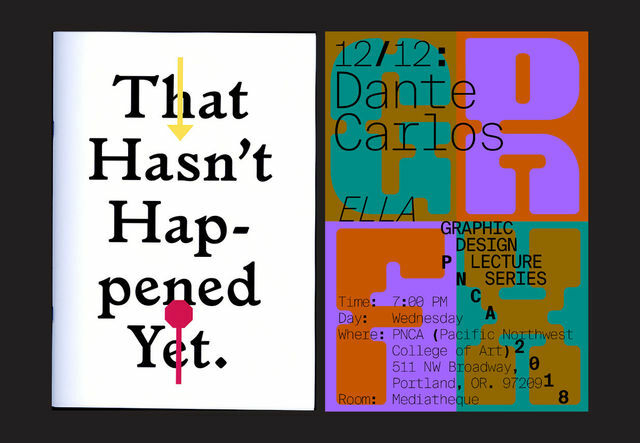 Dante Carlos is is an independent graphic designer, book designer, and educator. He also works collaboratively as a principal of ELLA. His projects include commissions for spaces, artists, agencies, local businesses, and cultural institutions, including a six-year stint at the Walker Art Center in LA, which he referred to as “a safe place for unsafe ideas.” Dante encourages learning by making, and enjoys finding unusual or serendipitous connections by rapid and reactive making and re-making in his own work. Dante has worked with a wide variety of clients, from cultural institutions to artists to corporations and TV networks, including Carnegie Institute of Art, Coca-Cola, Good Magazine, Institute of Contemporary Art (Miami), Institute of Contemporary Art (Philadelphia), Kurimanzutto, Levi’s, NBC/Telemundo, The New York Times, Sony, Walker Art Center, and UCLA. The Design Lecture Series launched in Fall 2016 as a way to open our doors and minds to the broad and vibrant possibilities in design. This year, we’re welcoming in regional design thinkers who break expectations of what design can be and do, to share their work and mingle with us on select Wednesdays through the year. Co-curated by Fisk Projects.